When you buy a car, you are given an owner's manual with instructions on how to care for your car. Septic systems can cost as much or more than a car, unfortunately nobody gives you a manual when they are installed. Some people don't even know they have a septic system! As a result, many septic systems fail unnecessarily. The price for failure is steep in two way. More than 1200 people in the US die each year from contaminated water, and failing septic systems are a leading source of waterborne disease outbreaks in the country today. In a 2000 EPA report, 31 states listed septic systems as their second greatest potential source of groundwater contamination. Septic system replacement is also very expensive, with costs often running from $5,000 to $20,000 or more. Fortunately, there are some highly effective, ineffective steps you can take to eliminate this problem. Before discussing solutions, let's look at why septic systems fail. 1. Use a washing machine filter. The good news is that lint can be prevented from entering the septic system through the use of a reusable, inline filter which attaches to your washing machine discharge hose. The filter, called the Filtrol 160, retails for $139.95. There are a couple solutions to this problem. You can upgrade your softener with a newer efficient model that uses less water and regenerates on demand, instead of a timer system that regenerates whether you use water or not. 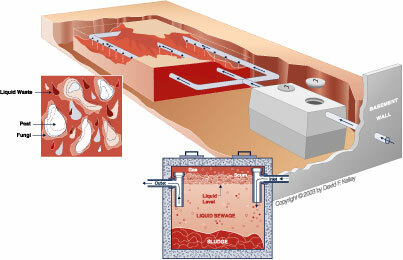 You can also install a mini septic system for your water softener. First of all, you should get your tank pumped on a regular basis to prevent excessive accumulation of solids in the tank. Under normal conditions, you should have the tank inspected and pumped every 1-3 years. Very important: tanks should be pumped and inspected through the manhole cover, not the inspection pipe. Your septic contractor should also install an effluent filter in the exit baffle of the tank. Effluent filters stop the larger solids from getting out to the drainfield. They are cleaned out every few years when you have your tank pumped. They are usually only about $80. Effluent filters are cheap insurance and along with a washing machine filter, one of the best things you can do to protect your system. Do: Divert surface runoff water from roofs, patios, driveways and other areas away from your drainfield. In quite a few cases, a tune-up can fix your system and you can avoid the high costs of replacing the system. This tuneup includes properly pumping the tank, cleaning (jetting) the drainfield lines, and installing washing machine and effluent filters. If these measures are not sufficient, some failed systems can be rejuvenated by fracturing the soil. This process utilizes a hollow tube inserted into the soil, then a 300 pound blast or air is injected into the soil creating thousands of tiny fissures. These fissures allow the drainfield to drain, creating an oxygen atmosphere and the aerobic bacterial colonies to repopulate. Aerobic bacteria, which require oxygen, typically live in the top 26 inches of the drainfield and process waste much more quickly than anaerobic bacteria. This process can be performed in a matter of hours with no digging or damage to the yard. One company which performs this service is Terralift International (http://www.terraliftinternational.com). If you have a clay soil which has become plugged due to sodium from wastewater binding with the clay, Septic Seep can help. These product releases sodium bonded clays and reopens soil, restoring passages air and water. It also has the benefit of dispersing greases and scums that clog the soil.